As a Certified EMDR Therapist and EMDRIA-Approved Consultant, Elizabeth Venart offers individual and group consultation to therapists seeking to strengthen their skills and gain certification. 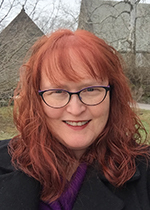 She is also the Regional Coordinator for the Montgomery-Bucks EMDRIA Regional Network, passionate about building a professional community of trauma-informed clinicians. Initially trained in EMDR over fifteen years ago, Elizabeth has used EMDR Therapy successfully with hundreds of clients with diverse presenting issues. She continues to attend advanced trainings regularly. Individual and group EMDR Consultation includes case presentation, discussion of challenging issues and obstacles to effective EMDR processing, creative case conceptualization with complex trauma, and a review of the latest research findings and clinical applications. EMDR has the power to help people make sense to themselves and heal at the deepest levels. EMDR Consultation supports clinicians in using EMDR effectively so that clients can experience the significant transformation possible. » Contact Elizabeth at ElizabethLPC@comcast.net or (215) 233-2002.